Sometimes, I strike on a right combination and came up with something delicious. Today is one of them. I surfed The Star’s site and read two recipes, from Amy Beh and Majorie Chiew. I combined both ideas and make use with whatever I have in my fridge and came up with this recipe. Rub the meat with fuyee and leave to stand for a while. Use a little oil and fry the meat till the water comes out. Pour the water away, rinse meat. Leave to simmer for several hours (3-4 hours or longer) until the meat is very soft. Taste for flavour. I did not use any salt as the fuyi is already salty. One can add some fuchok (dried bean curd sticks) which had been deep fried for extra ‘meat’. Add in just before turning off fire. Serve with white rice. 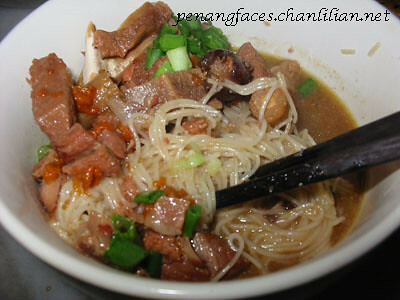 Alternately, boil some rice vermicelli (mee hoon). Put single portion and pour soup and meat, garnish with spring onions. I love this so much because it is not easy to find Chinese restaurants cooking mutton as Chinese believes mutton is ‘heaty’. Combined with dongguai, it becomes double heaty (though I am not prone). I remember eating something like this in Singapore once. I was staying in Little India (by accident) and found this small lane with a few shops selling braised mutton. The taste is something like braised beef (ngau lam meen).